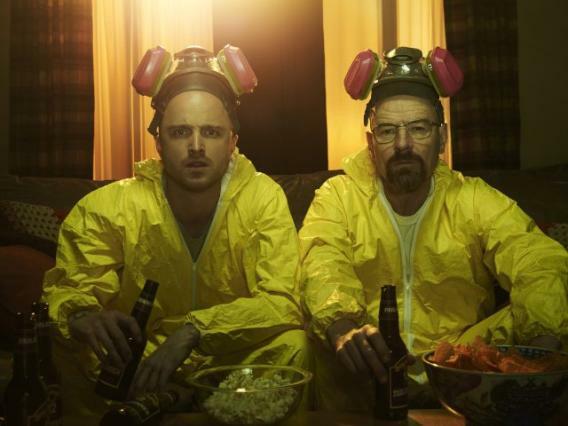 Binge-watching TV: Why you need to stop. Breaking Bad returns this Sunday, July 15, bringing millions of devoted fans back to AMC—although not enough to keep the network on Dish, apparently—and spurring others to catch up with the show’s 46 episodes in a time span that may require copious amounts of Walter White’s purest Blue Sky. To which I say: Slow down. Even if you aren’t taking crystal meth to fuel your rapid consumption of the best series of the last 10 years (yes, I have seen The Wire), you’re still ruining much of what makes the show—and all TV shows—great. TV binge-watching is a pandemic that has afflicted many of the nation’s college students, with sites like SideReel, Netflix, and Megavideo—not to mention full-season DVD sets—readily at their disposal. They disappear into their dorm rooms for days at a time and emerge with encyclopedic knowledge of Vincent Chase’s movie career or the Pawnee Parks Department’s budget. As Mary McNamara noted a few months back in the Los Angeles Times, Netflix has even catered its original content toward this consumption model by releasing all episodes of its own new seasons at once, encouraging fans to plow through entire seasons in marathon sessions. While it’s not surprising that America’s unprincipled youth have flocked to the latest trend, some of our most venerable critics have also hopped on the binge-watching bandwagon. Emily Nussbaum, formerly of New York and now of The New Yorker, went on a Breaking Bad bender last summer. “Binge-watching a show like Breaking Bad is probably the purest way to watch a great series,” she wrote. But if you ask me, she has ruined the entire batch. “I had sailed past waves of buzz, raves, and backlash, past interviews with Gilligan and Cranston, misleading promo reels, casting news, and Twitter debates,” Nussbaum writes. “Stepping outside the audience this way made it easier to enjoy the show’s story as a whole. But I also felt freer to detach myself from viewing it in episodes at all, taking the narrative in instead as an imagistic poem.” Grantland, meanwhile, declared that “binging on an entire season of a television show without commercial interruption allows you to completely ‘immerse’ yourself in the world of your new favorite show.” Which is a bit like saying you should “immerse” yourself in Vegas by blowing through all your gambling money by the time your wife and kids have checked into the room. I’m not saying that you must watch a show when it originally airs in order to fully enjoy it. Catching up on shows after they’ve aired is the only way anyone could keep pace with all the good TV out there these days. But there’s a proper way to do so, one that maintains the integrity of the art form. Before I lay out some guidelines, though, let me explain how marathon viewing destroys much of what is best about TV. 1. Episodes have their own integrity, which is blurred by watching several in a row. TV series must constantly sustain two narrative arcs at once: that of the individual episode—which has its own beginning, middle, and end—and that of the season as a whole. (Some shows, like Breaking Bad and The Wire, operate on a third: that of the entire series.) To fully appreciate a show, you must pay attention to each of these arcs. This is one of the defining features of television as a medium and one of the things that makes it great. A TV show is not “an imagistic tone poem,” and it shouldn’t be viewed as one. 2. Cliffhangers and suspense need time to breathe. Taking the time to ponder which Oceanic flight 815 member the Dharma Initiative brought back to the island or why Peggy decided to tell Pete she had his baby are an essential part of the experience of a series. Take the first season of Homeland: Much of the pleasure it provided came from wracking one’s brain each week—and changing one’s mind multiple times—trying to decide whether or not Brody was a double agent. That pleasure evaporates when you simply click “play” on the next episode. 3. Episode recaps and online communities provide key analysis and insight. Contra David Simon, TV recaps really do enhance one’s experience of a TV show. Even if you’re catching up on DVD or Netflix, you can still take the time to read recaps of nearly any episode on the A.V. Club, Hitfix, and here on Slate. They all provide great perspectives that you likely wouldn’t have picked up on your own. 4. TV characters should be a regular part of our lives, not someone we hang out with 24/7 for a few days and then never see again. Our best friends are the ones we see every so often for years, and TV characters should be the same way. I feel like I grew up with Michael Scott, because I spent 22 minutes a week with him every Thursday night for seven years. A friend of mine who recently cranked through all eight seasons of The Office in two weeks (really) probably thinks of Carrell’s character like someone he hung out with at an intensive two-week corporate seminar and never saw again. Binge-watching reduces the potential for such deep, Draper-like relationships. While the Grantland piece argues that binges are the only way to forge “deep emotional connections,” in fact, the opposite is true. 5. Taking breaks maintains the timeline of the TV universe. There are many exceptions to this rule, but TV series tend to place a few diegetic days between episodes and a few months between seasons. Thus, its rhythms match our own—when we watch them on their schedule. Watch an episode of Party Down a few days after finishing the last one, for instance, and notice how all the caterers have also had a few days off since their last gig. Or return to a new season of 30 Rock after a summer away, and see how the TGS writers are also returning from their vacation. If you need to catch up with a show, here are the guidelines: Wait a minimum of 24 hours between episodes and at least a couple weeks between seasons. If one TV show doesn’t provide a full night’s entertainment for you, pick out a few programs you’ve been meaning to catch up with and watch one episode of each. Which brings me back to Breaking Bad. If you haven’t watched it yet, I know you’re tempted to burn through four seasons over the next six days, so you can enjoy the final one with the rest of us. But Season 5 will still be there a few months from now. And I promise it’ll be much more satisfying if you’ve spent the previous months losing sleep entranced by the single episode you watched that night.